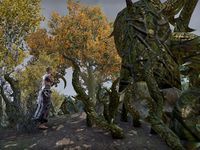 Locate Wyress Gwen near the Wyrd Tree to see how you can help. The elemental guardian asked me to head for the Wyrd Tree. I need to find Wyress Gwen and help save the Wyrd Tree. Speak with the Guardian of the Water. This quest starts on completion of the previous one. The Guardian of the Water asks you to find Wyress Gwen. From your location head north past Chill House until you come to a giant vine and a massive rock. Talk to Wyress Gwen who is standing nearby to finish the quest. This page was last modified on 6 December 2017, at 22:46.